James Buckley, Jr. - Meet the Author! 14 titles in the award-wining, top-selling kids' biography series, drawing on my knowledge of sports as well as my research abilities. These books tell the great stories of people (and one animal) that made a big impact on our world today. A pair of leveled books in the new Scholastic Readers series. One of the greatest adventures of all time comes to life in this biography of the great English/Irish explorer, Ernest Shackleton. A biography of the man who brought chocolate to America! Part of a popular series. All the sports news from the past year, plus a look ahead to the upcoming seasons. Test your knowledge of pro football using a built-in computer and 2,500 questions! Be the “first kid” on your block to find out how just about everything began! 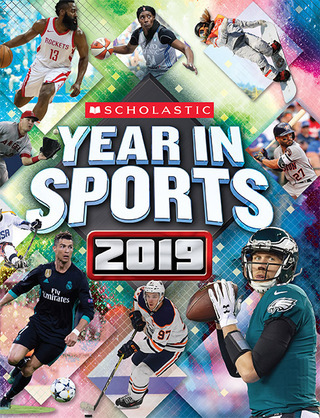 America’s top author of sports books for young readers, Buckley has written more than 200 books on sports and other topics for kids, including titles on baseball, football, NASCAR, soccer, the Olympics, and more. He has written 14 titles in the New York Times' bestselling "Who Was..." biography series, including titles on Muhammad Ali, the Wright Brothers, Milton Hershey, and Roberto Clemente. He produces the annual Scholastic Year in Sports, the top-selling sports title in Scholastic Book Fairs. He has written often about animals and the natural world, including such titles as the Animal Planet Animal Atlas, Bugopedia and Snakeopedia (Time Inc Books/Discovery). He also co-wrote four books in the award-winning X-Why-Z series from Time for Kids/Time Inc Books and two books in the Smithsonian series from Penguin Books for Young Readers on the International Space Station and Pluto. With his book-packaging company, he produced six DK Eyewitness titles on sports. He has also written popular reference books and titles on nature, history, space, and cars. (Under the pseudonym of K.C. Kelley, he has written more than 100 other books for The Child’s World, Mason Crest, and other school and library publishers.) His book-producing company, the Shoreline Publishing Group, has created more than 400 books for children and adults. Shoreline’s publishing partners include Scholastic, DK, Readers’ Digest, Triumph, Chelsea House, Chronicle, Barnes & Noble, Time Inc. Books, Bearport Publishing, PowerHouse Kids, and many more. Shoreline also produced the annual NFL.com Fantasy Football Preview magazine with Time Inc. Home Entertainment and the NFL. In 2010, he started a new publishing company, Beach Ball Books, which created and published nonfiction books for kids, mostly on sports. In 2013, Shoreline bought Beach Ball and will occasionally publish under that imprint. Beach Ball titles include The New Zoo and Sharkies: Amazing Animal Awards. Before starting Shoreline in 2000, Buckley was a senior editor at NFL Publishing, where he covered Super Bowls, helped start NFL.com, and created numerous children’s books on the league and its players. Prior to that, he was the editorial projects manager of Sports Illustrated, working on special sections on a wide variety of sports and major sports events. He has also been a newspaper columnist, a freelance writer, and the editor of several children’s magazines. Buckley is very involved with sports in his community, serving as a coach for youth baseball and soccer, and working on the board of directors of the Santa Barbara Foresters. That summer wood-bat college-level team has won seven national championships since 2004 and has been ranked in the national top four every year since 2003. Buckley’s work with the team includes producing the game program, raising funds, and occasionally calling games on the radio. Buckley has a BA in English from the University of California at Berkeley and also studied at the Radcliffe Publishing Course at Harvard. He lives in Santa Barbara, California, with his wife Patty and their two children. Here’s a (mostly complete) list of books written by James Buckley, Jr.